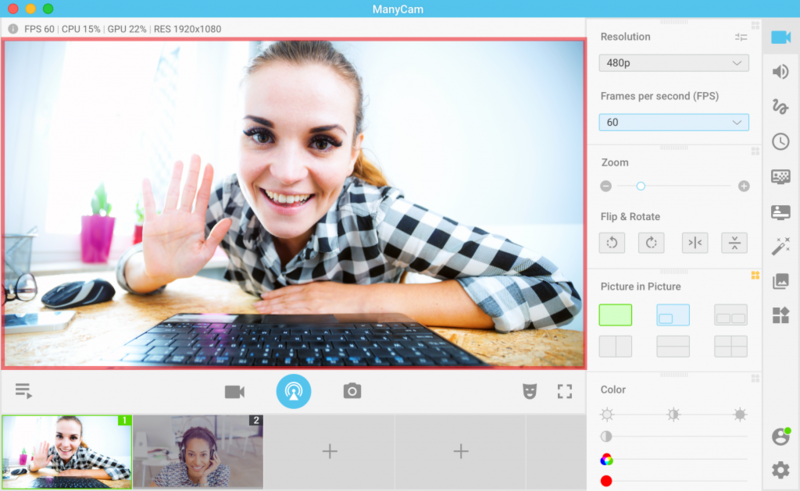 ManyCam is a free webcam software and video switcher that allows you to enhance your video chats and create live streams on multiple platforms at the same time. 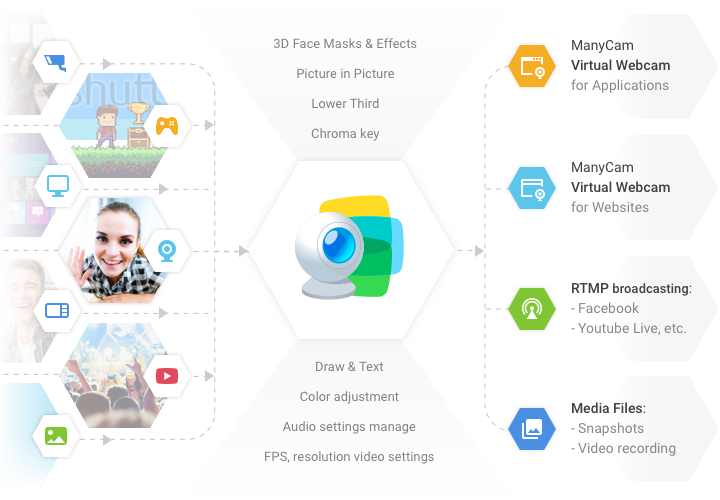 With ManyCam, you’ll be able to create professional-looking broadcasts on your favorite platforms, record your screen, add many effects, add music, apply green screen, draw over your video, add multiple webcams to your stream, share your screen, connect your mobile and IP cameras, stream games and many more. 2. How does ManyCam work? As shown below, ManyCam allows you to pick a video source for your stream, adjust it by applying effects and various multimedia settings, and start streaming/recording. The video sources you select and any changes you introduce to your feed will appear in the Main Live Window – the largest window that shows the output picture with all the effects and settings currently applied. The output image you see in the Main Live Window is being transmitted to the application where you selected ManyCam Virtual Webcam as a video source. By clicking on the Main Live window, you can choose the output video source: your web cameras, game, IP cameras, your desktop area, media files, YouTube videos, cameras of your mobile devices or some blank images. 3. How to activate ManyCam? 4. How do I add a webcam? To add multiple webcams/video sources to a single feed, use the Picture-in-Picture mode. Apply effects if your broadcast requires any (ManyCam effects, Chroma key, Lower third, etc). 6. How do I use ManyCam with a website/application? 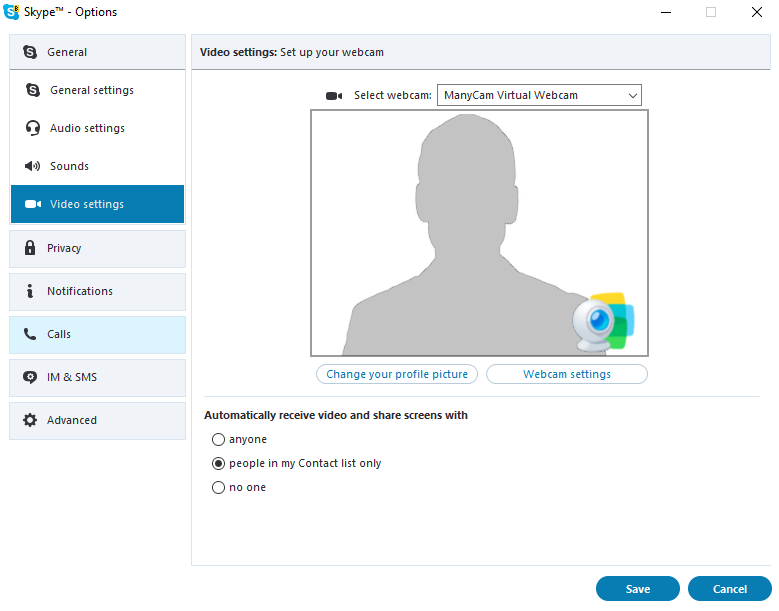 To use ManyCam as a webcam in an application or on a website, you need to select ManyCam Virtual Webcam as a video source in Video settings. The output image you see in ManyCam’s Main Live Window is being transmitted to an application/website where ManyCam Virtual Webcam is selected as a video source. Set your native microphone as an Audio Input and your speakers as a Playback Device in ManyCam’s Audio Settings. 7. 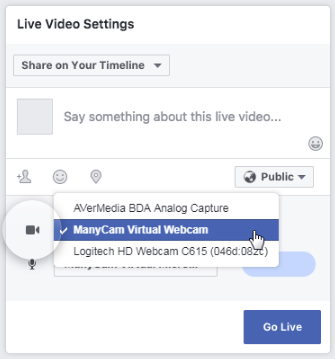 How do I go live on Facebook with ManyCam? 8. How do I make a recording? In case you need to capture the audio feed, make sure you’ve added your microphone or other audio input devices. By default, all recorded videos are added to the ManyCam Gallery and saved to user’s profile folder on your computer’s hard drive. 9. How do I connect a mobile device? 10. How do I apply Chroma key to my broadcast? 11. 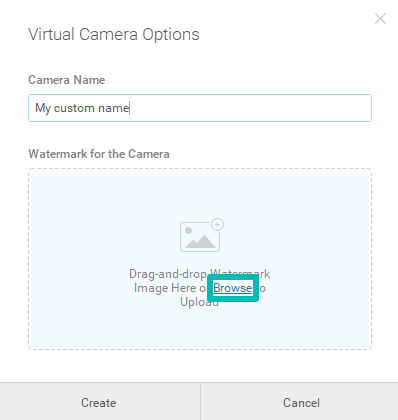 How do I apply a custom watermark and set a custom name for ManyCam’s Virtual Webcam (Windows only)? This setting is available in the General tab of the ManyCam settings. (ManyCam menu → Settings → General). Click browse and add your watermark. An image with a transparent background is preferable.